Scan and monitor your network. With Network Radar. 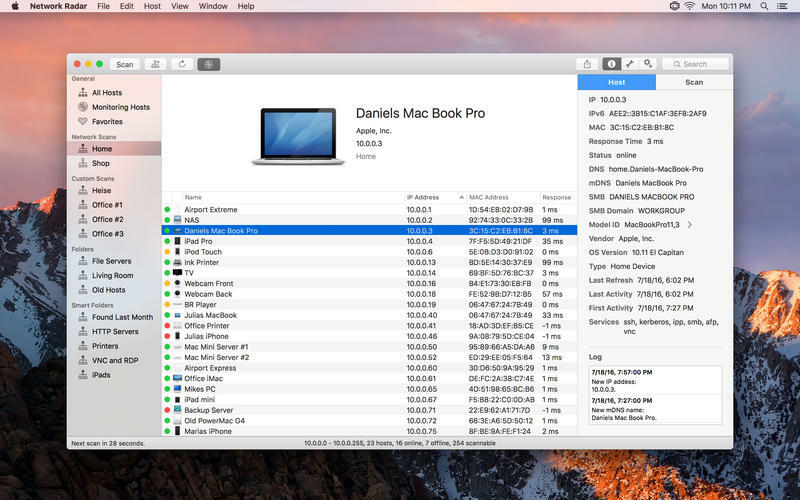 Network Radar is a powerful network scanning and managing tool that everyone can use. 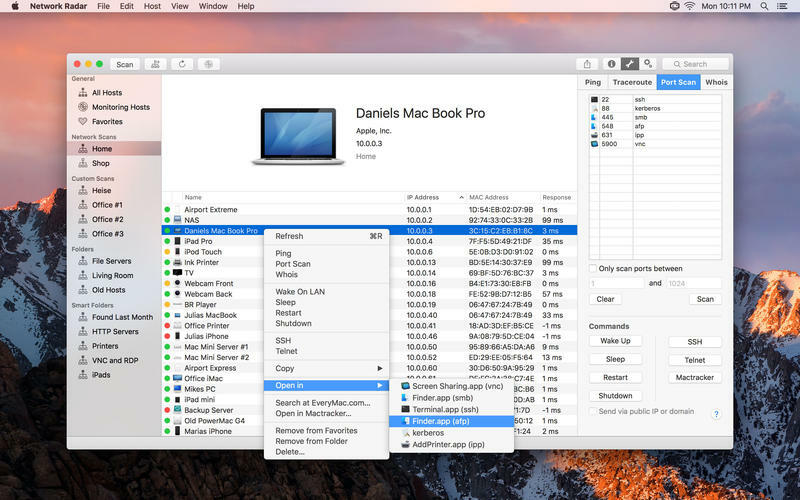 Featuring an easy-to-use and streamlined design, the all-new Network Radar 2 has been engineered from the ground up as a modern Mac application. All you have to do to use Network Radar is to click the Scan button. No configuration is required. But Network Radar is more than a simple IP scanner. It comes with useful network tools, such as Ping, Portscan, Traceroute and Whois. 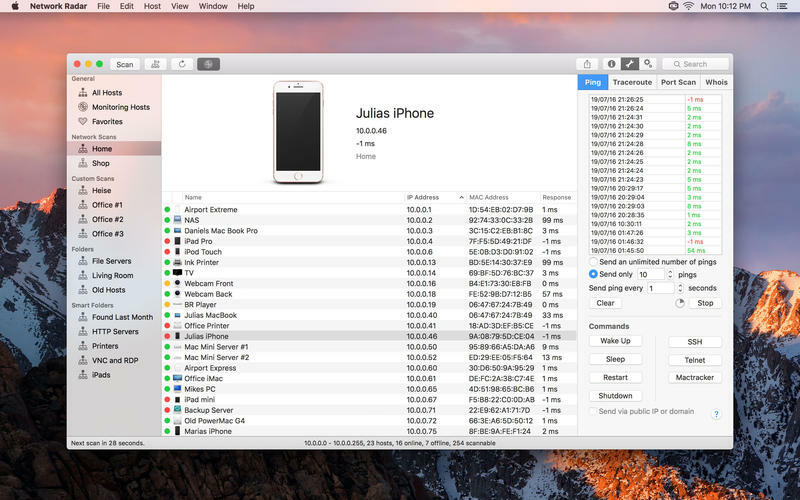 Furthermore you can send commands to your devices with the click of a button. 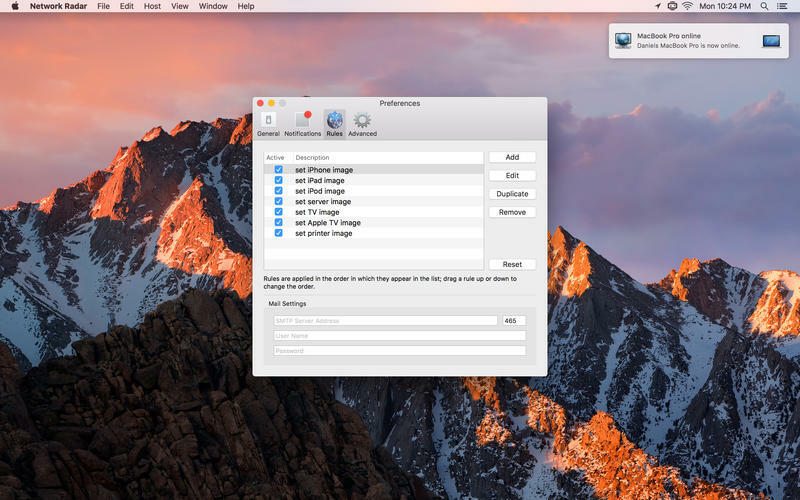 Use Wake On LAN with every Wake On LAN capable device and shutdown, restart or send other Macs to sleep, even if they are not within your local network. Once Network Radar has scanned your network, it lists all found devices. Select one to see more details, such as IP, IPv6 and MAC address, vendor name, DNS names, mDNS name, NetBIOS name, NetBIOS domain, open ports, OS version, response time, the Mac model identifier and much more depending on how much information your device and network reveals. Let Network Radar monitor a scan and get live updates on changes in your network. All changes are logged so you always know what happened when. You may also want to receive notifications when a device enters or leaves your network. With the possibility to configure custom rules and actions Network Radar can send yourself a mail as soon as a certain server goes offline or play a sound when a FTP Server appears in your network. The possible configurations are endless. Organise your hosts in folders. You want all your iPads in one folder? Just create a smart folders and let Network Radar do the work. By binding scans to networks, Network Radar always knows if a devices is reachable or not, making it easy to refresh or monitor a bunch of devices even from different networks. ・Network Radar is now ready for macOS 10.13 High Sierra. ・From now on, automatically refreshing only pings a host, but does not trigger the network tools to start. ・In some cases Network Radar would create wrong log entires that lead the app to freeze after a while. ・Sometimes DNS resolution did not work.